Keith Chapman is on the receiving end of a multibillion-dollar empire fueled by shows on screen and stage, backpacks and bathing suits, cereal boxes and plastic toys. The 59-year-old lives in Monaco, the affluent principality on the Riviera. He drives Aston Martin sports cars while collecting millions in royalties each year from a group of cartoon puppies that he drew in 2011 and who now appear on televisions in more than 160 countries speaking more than 30 languages. Almost nobody recognizes Chapman on the street but nearly any preschooler or school-age parent has likely seen his work. Now in its fifth season on Viacom Inc.’s Nickelodeon and Nick Jr., Paw Patrol is the most-watched television show for preschoolers this year, according to Nielsen, and Viacom estimates the show has generated about US$7 billion in global retail sales. In the fourth quarter of last year, the research firm NPD Group found, Paw Patrol got the largest share of U.S. licensed merchandise sales from kids under 15, topping the NFL and Disney’s Frozen, Mickey Mouse and Star Wars. Paw Patrol may be the high watermark for its breed of carefully engineered global children’s entertainment. It would take “a perfect storm” to create another show as popular, said Jim Silver, an industry analyst and founder of toy review site TTPM. Before Paw Patrol first aired five years ago, there had been just a few preschool hits since Sesame Street: Peppa Pig, Blue’s Clues, and Dora the Explorer. But nothing that utterly dominated the landscape, Silver said, creating an opportunity for Paw Patrol to fill the void. The chances of a hit are already slim. Success in kids TV requires more than just a great idea—you need talented producers, animators, voice artists, writers and directors, as well as retailers committed to putting toys on its shelves. 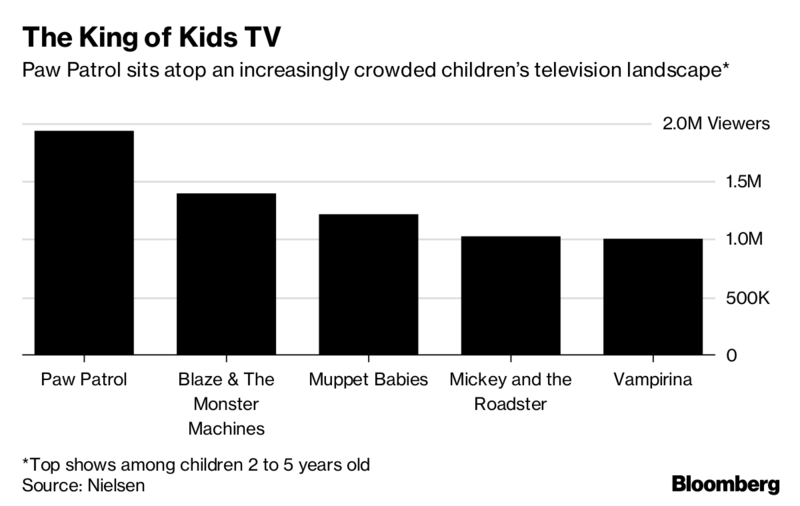 Now the prospect of a mega-hit has become even slimmer because there are so many shows on multiple platforms, like Netflix, Hulu and YouTube, diluting preschoolers’ attentions. The ratings for kids TV networks like Nickelodeon, Cartoon Network and Disney Channel are in steep decline. That means fewer kids to sell toys to—and, with the death of Toys “R” Us, fewer places to sell those toys. The premise of Paw Patrol goes like this: A 10-year-old boy named Ryder organizes a team of six puppies with oversize eyes and paws and real-world jobs like firefighter or police officer. In every episode the pups jump into transforming vehicles and save a cat stuck in a tree, stop a runaway train or otherwise prevent a cartoon calamity. Chapman is not the only one cashing in on the Paw Patrol frenzy. The co-founders of Toronto-based Spin Master—the toy company that bought Chapman’s idea—are billionaires and among Canada’s wealthiest people. Spin Master owns the rights to sell Paw Patrol toys and the broadcast rights in Canada, while Viacom’s Nickelodeon has the merchandising rights for other categories and the television rights outside Canada. There are dozens of Paw Patrol licensing categories, from live theater to fruit snacks to birthday cakes to a theme park debuting this week in the Mall of America. The money flows in from consumer products of all sorts. Take Viacom’s deal with Orajel for Paw Patrol-branded toothpaste: Orajel pays a fee to Viacom, which shares the revenue with Spin Master—and after Spin Master takes a cut, Chapman gets a piece of what’s left. Chapman was born in Basildon, a suburb of London, and his teachers often threw him out of class because all he wanted to do was draw cartoons. He graduated from art school and started his career in advertising, then took a job working for Jim Henson and the Muppets. That’s where he learned the business of kids entertainment. He spent nights trying to create his own characters and came up with ideas for children’s books, TV shows, cartoon strips and greeting cards. “I’ve got this mind that won’t stop churning out ideas,” said Chapman, who has at least 25 concepts in various stages of development, including kids programs, reality shows, sitcoms and movies. In the late 1990s, he got his first breakthrough with Bob the Builder, a show about a friendly construction worker and his team of machines. He sold the concept to Hit Entertainment, which is now owned by the toy giant Mattel. It became one of Britain’s most popular kids shows. In 2002, he started his own production company, Chapman Entertainment, but when the global recession hit in 2008 parents stopped buying expensive toys. The British department store chain Woolworths, which shut down in the economic carnage, accounted for about 20 per cent of his company’s income. So Chapman was forced to shut things down. The bank seized his intellectual property and sold the shows to DreamWorks Animation, which is now owned by Comcast Corp. About 80 employees working for Chapman’s company were laid off. Around that time came the call from Spin Master, which was soliciting famous creators of kids TV shows for ideas around “action adventure” and “transformation.” Chapman thought all kids could relate to puppies; his three sons had dogs growing up, as did Chapman. Dog kennels, he figured, would be the perfect device for transforming into emergency vehicles. He called his concept “Robbie and the Rescue Dogs.” Spin Master liked the idea but thought the name wasn’t right. The dogs, after all, do community service as well as rescue missions—Rocky, a mixed breed, is devoted to recycling. Paw Patrol was born. Chapman gets a cut of the fee for every episode of Paw Patrol that airs, plus consulting fees and a share in the profits from licensing and merchandise. He estimates that his shows, including Bob the Builder, have generated more than US$10 billion in total revenue, including broadcasting fees, licensing and merchandise, and DVD sales. Those kids include Justin Feist, age 2, of Rockville, Maryland. “He’s a Paw Patrol fanatic,” said Justin’s mother, Shalahea Reed, who spends up to US$80 every other week on Paw Patrol clothes, toys and downloading new episodes. In February, she plans to take her son to a live Paw Patrol stage show in Virginia. “Everything that comes out of his mouth is Paw Patrol,” she said. So why is Paw Patrol so popular? Analysts and those involved in the show offer several theories. For starters, the characters are puppies. “Every kid wants a puppy,” said Jennifer Dodge, the executive vice president of Spin Master Entertainment. Spin Master tries to keep Paw Patrol fresh by introducing new storylines, like a recent spy theme that featured new villains and vehicles. The company also obsessed over every detail of the characters, like ensuring their paws were slightly too big for their bodies, making sure the bulldog's posture was not the same as the Dalmatian’s, and casting children with slightly different voices to distinguish between the characters. Viacom, meanwhile, has spent large sums of money on marketing and schedules the show excessively. Paw Patrol airs several times a day every day on Nickelodeon and Nick Jr., not to mention occasional Paw Patrol marathons that can run for seven hours straight. Paw Patrol also appeals to a broader age range than most preschool shows, creating a longer window to sell merchandise, Robinson said. Most preschool shows, like Dora or Peppa Pig, typically reach kids who skew younger. Paw Patrol has fans as old as seven because its teamwork-oriented storylines are slightly more complex and coincide with the developmental stage of slightly older kids, Robinson said. The show also appeals to both genders. Girls buy into the nurturing aspect of the puppies while boys are attracted to the transforming vehicles. The dogs play the role of police officers and firefighters, and Spin Master’s Dodge knows those are the types of jobs that preschoolers idolize. Most important, the toys are easy to play with, said Silver, the toy reviewer. Unlike other TV shows, entertainment for children isn’t only about attracting a large audience. The corporate interests are developing characters that sell toys—what industry experts call “a play pattern.” Paw Patrol has a narrative that’s easy for kids to understand, and in case they need any help there are Spin Master-made YouTube videos of people playing with Paw Patrol toys that have racked up millions of views.